I just spent the last hour watching two buggies – or SRVs – speeding across the surface of a rocky planet, zipping through canyons, performing barrel rolls and looking like a lot of fun. I regret nothing. Well, not from the last hour anyway. 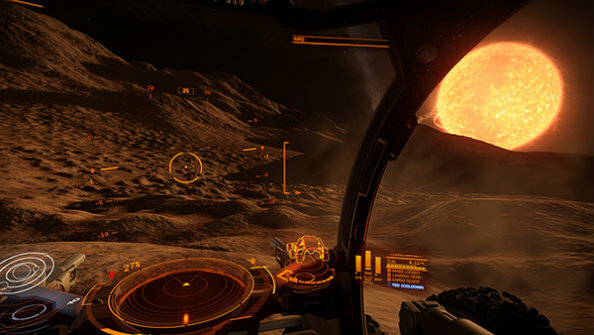 Last time the Elite: Dangerous livestream showed us the science and technology behind creating realistic planets. The latest livestream began with a look at a Cobra touched down on the planet’s surface. We had a little drive around it, admiring the detail that Frontier Developments added in when they originally created the ship’s models. Remember, planetary landings – and eventually walking around – have always been one of David Braben’s plans for the game from the very start. It’s humbling to see the ships from this new perspective, especially when the autopilot sees it suddenly take off and shoot into the stars. It is a magnificent sight. The buggy, with its six wheels and pliable frame, has been designed to fold up and stow away in the cargo hold of the ships, although this feature isn’t being shown yet. You also have a turret and a shield, but combat isn’t the focus of this video, so that wasn’t shown either. It’s nice to know there will be combat in the vehicles, though. This stream was all about driving at speed across a dusty planet and jumping over hills. Using the wheel thrusters you can boost up or down, giving yourself lift for a big jump and feathering it on the way down to reduce impact, or giving your SRV downward force to create more traction on low gravity planets. You can even perform mid air acrobatics like flips and barrel rolls, but manage that energy or you’ll crash down and damage your ship. It looks very impressive, even at this early stage. The addition of combat, some sort of fuel management system and points of interest will only make it more appetising. I can’t wait to see more. We will add the video in so you can see it for yourself as soon as it’s archived.